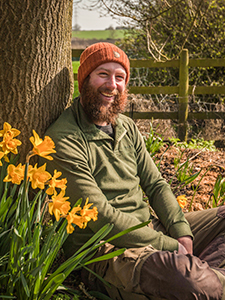 Growing up on his family farm in Rutland, Martin has had a love for nature and wild spaces since he was a child. Through childhood Martin was in Beavers, Cubs and Scouts and in his teens the Army Cadets. An interest in Bushcraft had always been present but it wasn’t until his twenties that he actively went out to learn some of the skills involved. It quickly became a passion and a thirst for the traditional skills and knowledge motivated him to go on a course with Frontier Bushcraft. Since then he has been on several courses with Paul since 2015 including, the Tree and Plant Identification Masterclass, Navigation 101, in 2016 the Expedition Canoeing Skills Course and in 2017 the River Spey Expedition. Martin is a passionate amateur photographer and his camera is never far away, capturing wildlife and the natural world whenever he can. He is also a keen traditional archer and has been shooting the English longbow since he was 16. In 2016 Martin and his wife travelled to Kenya and spent time with members of a Maasai tribe. Showing a keen interest in their intimate knowledge of Bushcraft Martin found them to be incredibly open with sharing this knowledge and was lucky enough to spend time in the bush learning some of their uses for plants and trees along with friction fire lighting skills too.